Americans and Germans have a lot in common. One is their love for cheese cake. 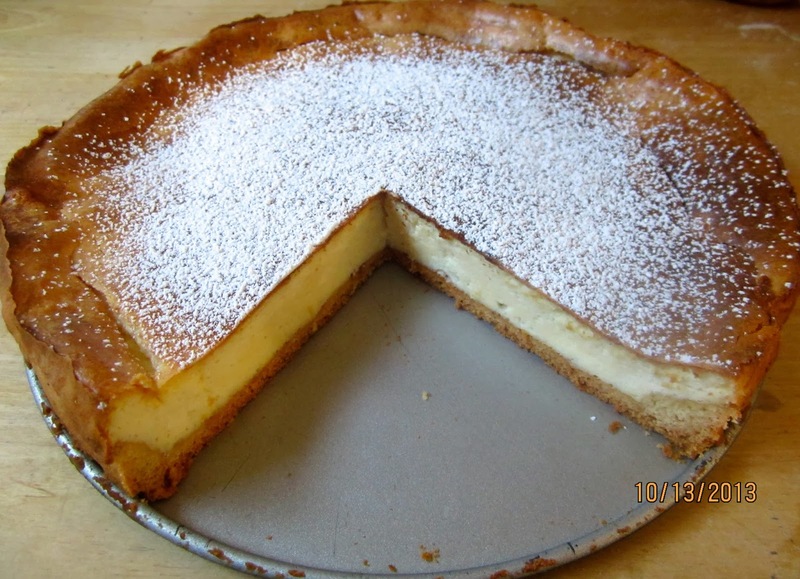 Though both pastries taste great, Käsekuchen is distinctly different from its US cousin. Cheesecake crust is made with cookie crumbs, very practical, and a good recycling of even stale cookies. German Käsekuchen has a short crust, more fuss, but buttery decadence. The real difference, though, is the filling. 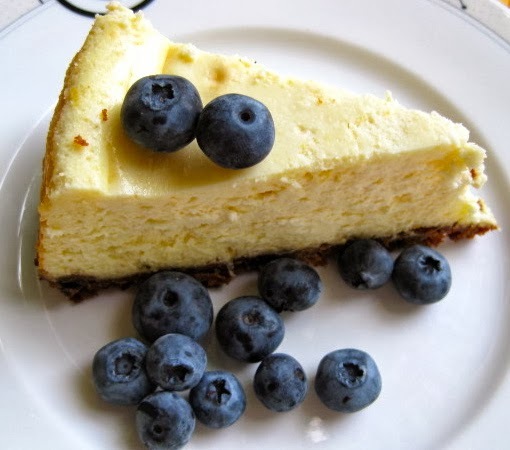 American filling, made of mild, more neutral cream cheese, can be varied with many different flavors (like Limoncello-Cheesecake). 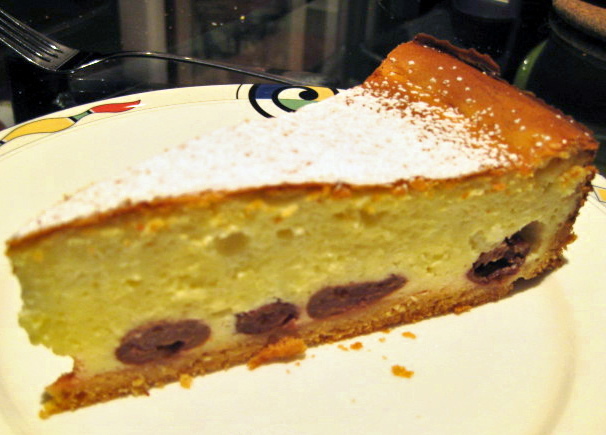 Käsekuchen is made with quark, a fresh cow milk cheese that is less creamy, more acidic, and contains more water. Quark (curd cheese), the base for many different types of European pastries and desserts is unfortunately hard to find in the US, or outrageously expensive – and it doesn’t taste the same. Though in desserts quark will be often paired with fruits, German cheese cake bakers tend to purism, the filling might have raisins, and sometimes other fruits, like sour cherries or apples. Another important difference: German Käsekuchen is notably less heavy and dense than its somewhat massive American counterpart (in spite of the short crust!). 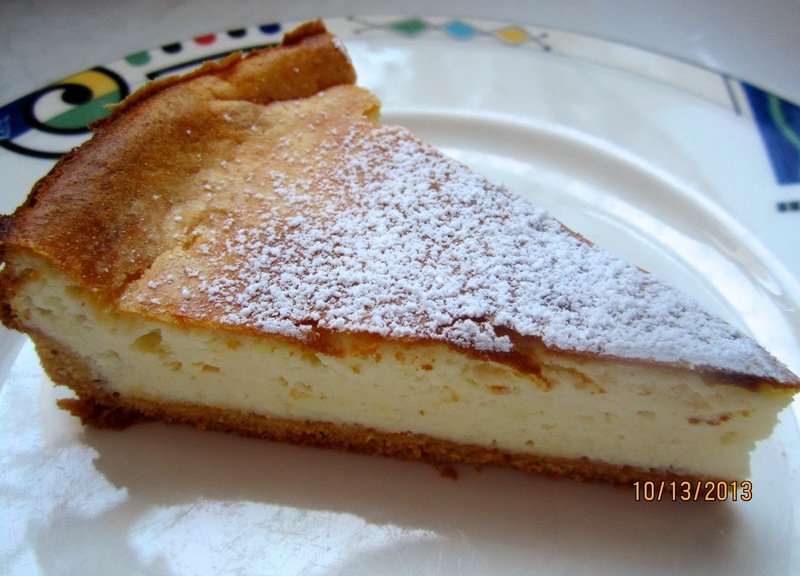 Though I do like American cheese cake with its seemingly endless variations, I love my German Käsekuchen. But how to re-create it in this sadly quark-less country? I looked at the traditional recipe in the Mother of German Baking Books (in English: “German Baking Today,) and started with the adaptation process. By separating and beating egg whites stiff you can make baked goods airier and lighter, I needed more egg white. I didn’t want to use heavy cream, because cream cheese is creamy and rich by nature, but one more egg yolk wouldn’t hurt. I also upped the lemon taste – cream cheese is less acidic and, in my opinion, only a lemony Käsekuchen deserves the name. The result of several cakes worth of testing was finally a “real” German Käsekuchen – my husband’s absolute favorite (with cherries). Preheat oven at 400ºF/200ºC. Drain sour cherries, if using. Mixer: Sift flour and baking powder in mixing bowl, then add other crust ingredients. Knead first at low speed, then increase gradually to medium speed as dough firms up. Knead until smooth. Or simply process all ingredients in a Food Processor. 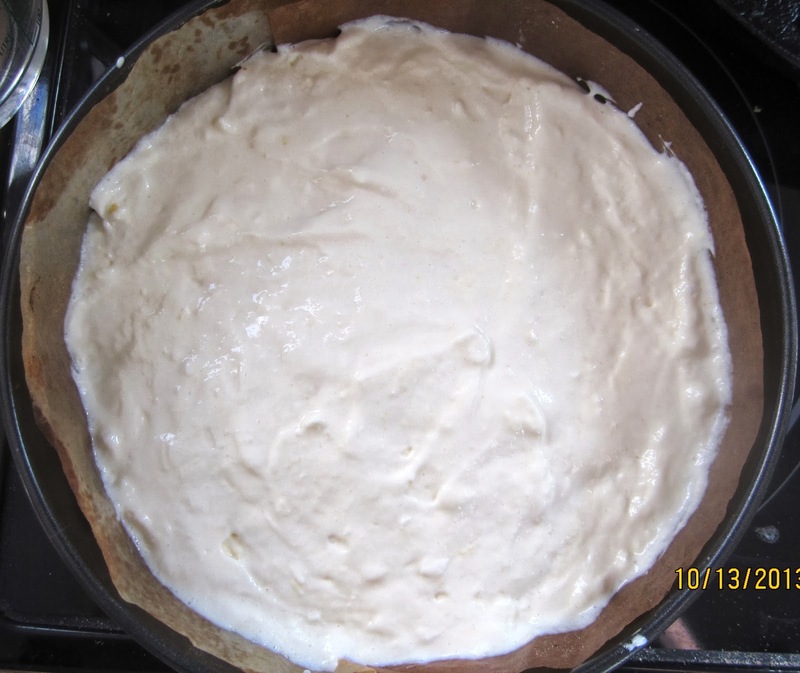 Roll out 2/3 of dough over the bottom of a 28 cm/11″ (not yet assembled) springform pan (greasing the bottom is not necessary). If the dough sticks to the rolling pin, cover it with plastic foil. Grease and attach rim. Shape rest of dough into a long rope, adding 1 tbsp. flour if necessary. Press dough rope along the side of the pan to make a rim. Or, simply, place all the dough in the pan, and press and pat it in place, pushing it up the sides to make a rim. 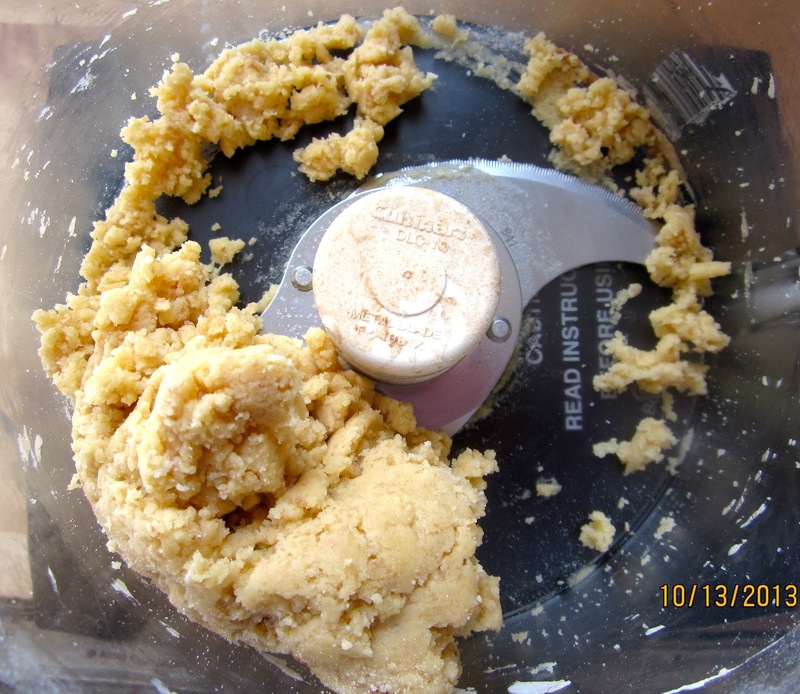 Prick dough several times with fork to prevent air bubbles from forming. Bake crust for 10 minutes. Remove from oven. Lower oven temperature to 350ºF/175ºC. 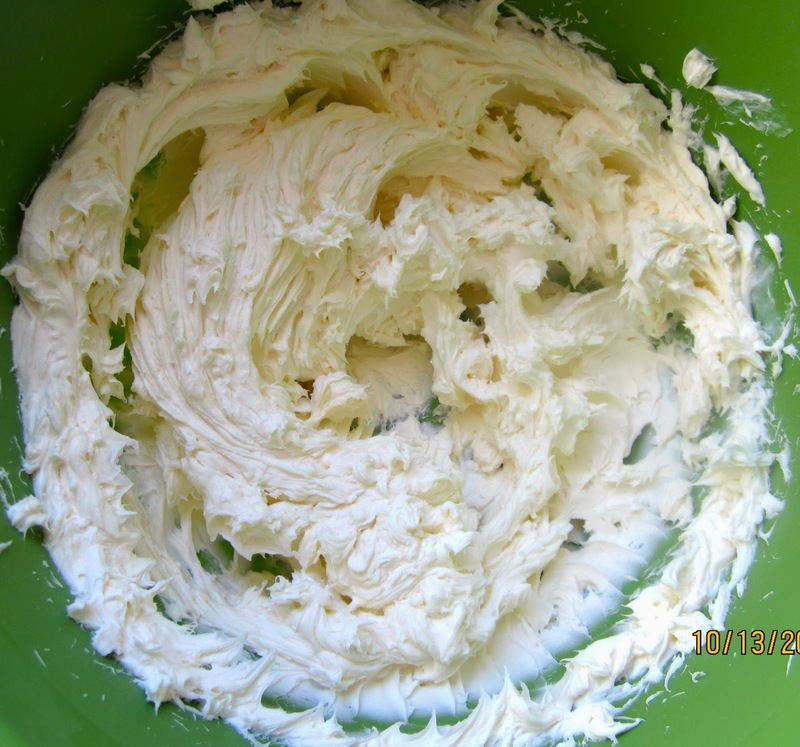 In separate bowl, whisk egg whites until soft peaks form. Fold into cream cheese mixture. Distribute cherries evenly on pre-baked crust. Pour cream cheese mixture over crust and smooth with spatula. Bake for 70 – 80 minutes, or until needle comes out clean. Leave cake in switched-off oven, door slightly ajar, to cool slowly, as long as possible. Finish cooling on wire rack. Dust with powdered sugar before serving. Käsekuchen tastes even better the next day, and keeps in a cool place for several days. A quarter is gone already! And if you visit Portland, ME you can even sample my delicious German Käsekuchen: the nice (and authentic) German Restaurant Schulte & Herr serves it, baked from my recipe! Yes, I once bought quark from a dairy in Vermont, very expensive, and then it didn't taste right. I also made quark from buttermilk, but wasn't quite satisfied with the result. Unless you really get into cheese making, with rennet, mesophilic starter and calcium chloride, this is an easy way to substitute it at least in Käsekuchen. It really tastes like the real thing. My birthday on New Year's eve and I would like to make your cheese cake for the picnic we will have that day. ( Our turn for summer!) I am a little puzzled by your instructions for lining the baking tin. It's your tip to use plastic wrap to prevent sticking that I am unsure of… I understand that two thirds of the crust dough is spread over the bottom 'plate' of the spring form, then the rest of the tin is clipped in place. Next the rest of the dough, is formed into a log long enough for the circumference, then it is worked up the sides. Just not sure where the plastic wrap comes in handy. Also do you line or grease the tin at all? When I use springform I place a piece of baking paper (you say parchment in the USA) over the plate before attaching the rest of the tin. Then I trim the paper which is protruding. Depending on what I am making, I either spray the sides or add more baking paper, using a little of my dough as 'glue' to hold it in place. Glücklicherweise hab ich ja keinen Quark-Notstand hier, die Variante würde mich aber durchaus auch reizen mal zu testen. Aussehen tut er jedenfalls sehr gut. Thanks for pointing this out to me, Robyn. The suggestion to use plastic wrap is only meant to prevent the dough from sticking to the rolling pin. Actually, what I usually do is simply press and pat the (whole amount) of dough with my hands into the pan, and push it somewhat up the sides. I don't make the rim really high, because if it gets so thin it might get too brown. With a short crust, you don't need to grease the pan, or line the bottom. It doesn't stick. You can grease or line the sides of the pan with parchment paper, because the filling will rise above the crust. I will edit the post accordingly. When I bake an American cheesecake, with a cracker crumb crust, I will always line the whole pan with paper. A Happy New Year for you and your family, too! Tjaaa, du sitzt ja an der Quelle, Ninive! Probier ihn ruhig mal aus, es ist immer gut, eine Alternative zu haben. Thanks. Understood. (I did stare at the photos trying to distinguish between crust and baked filling, now I really get it) Will report back in the new year. I think Brian would like this, we get quark here but I am not sure if it is echt or some sort of English equivalent and using low fat cream cheese never seems to work for me, it goes all watery due to the binders they use once you mix it up. I will look and see if I can find a German branded quark in the shops, my cheese cakes are always a bit hit and miss and I don't make them very often! Happy New Year Karin and Happy Baking!! Can you get the regular Philadelphia? That works very well, it doesn't have to be the low fat version. That is something I hate about low fat products (or, worse, no fat ones): there is so much stuff added to enhance the otherwise unpleasant taste, that I hardly see a benefit in them. The no fat version of my favorite yogurt has more calories than the regular – thanks to all that extra sugar. Versuch's mal, Ute, mein amerikanischer Mann ist auch ein grosser Fan von deutschem Käsekuchen, und ich backe ihn daher recht häufig. Hier ist wirklich kein Unterschied zu einer Version mit Quark zu schmecken. I will bake this on my treat day next Weekend * trying to lose weight I have something naughty to eat every second week. DROOLING . Ich freu mich schon sehr auf diesen Kaese Kuchen, ich bekomme nicht immer Quark here in England. Made your cheesecake yesterday and it was absolutely the same as german kaesekuchen. I am the happiest german alive right now. Coworkers and neighbors were also extremely impressed with the outcome. Thank you so much for this awesome recipe and saying good bye to quark. Lass mich bitte wissen, wie er dir gefällt. Prima, Sabine, darüber freue ich mich sehr. Lol “quarkless country” way to funny but so true. Am wochenende ver such ich mal dein brot. Hab noch nie einen sourdough starter gemacht. Hast du vielleicht ein rezept dafuer. Ok my iPad hates german so will will continue in english. I want to try the bread with a rye starter. There are plenty of recipes on line but wanted to see if you could give me some tips maybe on what to look for. Btw making more cheesecake this weekend to bring to work by popular demand. Usually my boyfriend snickers at me when I try to bake something since I'm usually so bad at it and u helped me wipe that snicker of his face hehe. Haha, Sabine, that should teach him a lesson! I have a DIY sourdough tutorial – look in the tab PANTRY on top of the blog. I made my first starter with this method, and a few times afterwards, again, when I forgot to keep some in reserve. It always worked for me. Und wenn du irgendwelche Fragen hast, frag mich gern! Ok, have checked on the starter and it is written so well. I bought all the ingredients and will let you know how everything turns out. Will post on the bread site. Ja, über eine Rückmeldung würde ich mich freuen. Wünsch dir eine schöne Woche, bei uns ist nochmal richtig der Sommer mit Hitze ausgebrochen, also wird die A/C noch nicht eingemottet.